This month for my Io Volcano of the Week series, we are looking at volcanoes that were observed at moderate resolution (160-280 meters or 525-920 feet per pixel) during Galileo's I25 flyby of Io on November 26, 1999. Last week, we examined Zal Patera, a large volcano on Io's northern hemisphere that has been the site of large lava flows and a small volcanic plume. This week we take a look at Emakong Patera, a large lava lake smack dab in the middle of Bosphorus Regio. While a largely inactive lava lake during the Galileo mission, high-resolution observation of this volcano by the camera and near-infrared spectrometer on Galileo have relaunched the debate over the predominance of sulfur and silicate volcanism on Io. Emakong Patera, like Zal Patera described last week, is a larger than average, roughly heart-shaped patera, or volcanic depression, being 79 kilometers (49 miles) long north to south and 72 kilometers (45 miles) wide west to west. The name of the volcano is derived from the mythology of the Sulka people of the southeast coast of the island of New Britain in Papua New Guinea. In the myth, Emakong dives into a stream to retrieve an ornament he dropped. Upon reaching the bottom, he found that he was in the yard in front of a house. The people from this house allowed him to stay for the night around the hearth fire, both alien concepts to Emakong. The next morning, Emakong was given night and fire as gifts to bring back to his own people. Unlike another volcano named for a mythical fire bringer, Prometheus, Emakong had never been seen as a very active volcano, despite its dark surface and numerous surrounding lava flows. The surrounding lava flows however, are not dark but are bright instead. Bright white to yellow flows radiate for up to 370 kilometers (230 miles) from the edge of Emakong across much of Bosphorus Regio. Based on medium-resolution imagery acquired in November 1999, researchers discovered that some of these flows are fed by narrow channels that formed when lava overflowed the walls of the Emakong basin. Other bright flows, particularly along the western margin of Emakong, appear to be broader over-flows from the patera. Galileo scientists suggests that rather than being composed of silicate basalt like most of the lavas seen on Io, instead Emakong's lava flows are composed of sulfur. When quenched at different temperatures, cooled sulfur flows can have different colors. The higher the quenching temperatures, the darker and red the cooled flows appear. So it would follow that the cooled sulfur lava in the channels that feed the bright flows and on the floor of Emakong Patera is darker than the bright flows themselves, as they were quenched at higher temperatures. Alternatively, the flow may have originated as a silicate flow that was over time covered more and more by sulfur. 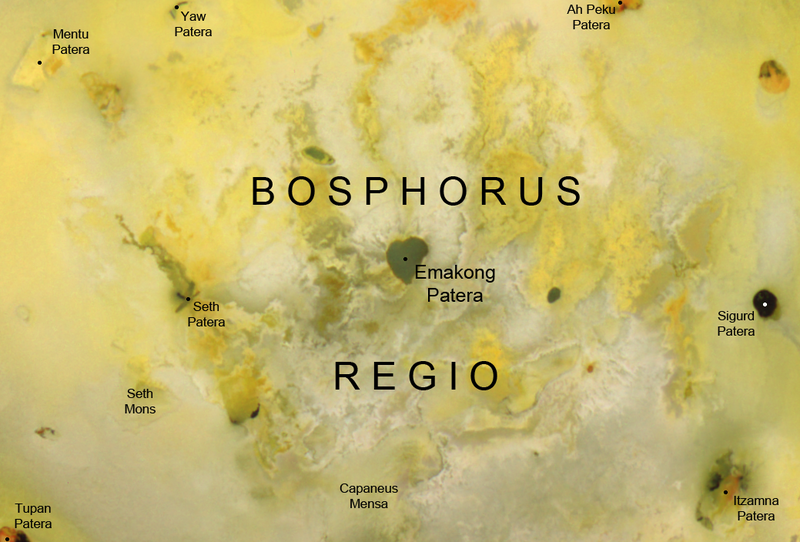 Such as process is seen at Chaac Patera, where brighter sulfur ponds in the valleys within the silicate lava that covers the patera. Over time, this slowly brightens the lava flow. Like Chaac, Emakong also has a greenish color, thought to form from the interaction between cooling, iron-rich silicate lavas and sulfur. Personally, I prefer this theory over one that suggests that this is a sulfur flow. During the Galileo and New Horizons, several examples were observed where bright yellow flows were covered over by basaltic lava during more recent high-temperature eruptions. 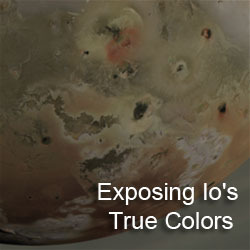 This provides a potential connection between current activity on Io and earlier activity, though there are examples on Earth where the same volcanic vent has been known to release both sulfur and silicate lava. While Emakong has been generally inactive in the current epoch, it is always possible the volcano may later re-activate these flows, forming broad silicate lava flows to cover the older sulfur-coated flows. Emakong and the dark channel that flows to the east from its margin were imaged at high spatial resolution by both the SSI and NIMS instruments on Galileo in October 2001. The mosaic at right shows the southwest margin of Emakong Patera with its dark band of hot lava along its outer margin. The dark channel that is the focus of this observation starts out as a crusted over, multi-braided channel near the edge of Emakong before turning into an open channel after flowing a few kilometers to the east. The morphology of the channel in this region is similar in appearance to lava lake overflow channels that have formed at Kilauea when the overflow occurs over an entire sector of the lake with hot, low-viscosity lava that had a variable flow-rate. The flanks of the channel are formed by relatively dark material, which is itself surrounded by bright material. Further downstream, the channel becomes broader and progressively more crusted over, suggestive of the transition from an open channel lava flow to a lava tube. The mix of bright and dark material in the plains southwest of Emakong Patera is difficult to assess. 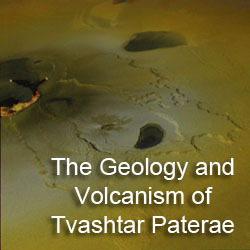 The lack of clear topographic shading makes it difficult to even determine whether bright material lies on top of dark, or vice versa, which is needed to determine stratigraphy of these lavas. The shading nearer the lava channel does suggest that lava over flowing the channel is initially dark before becoming bright, which could occur if hot sulfur is quenched near the channel, while cooler sulfur is quenched more distally. 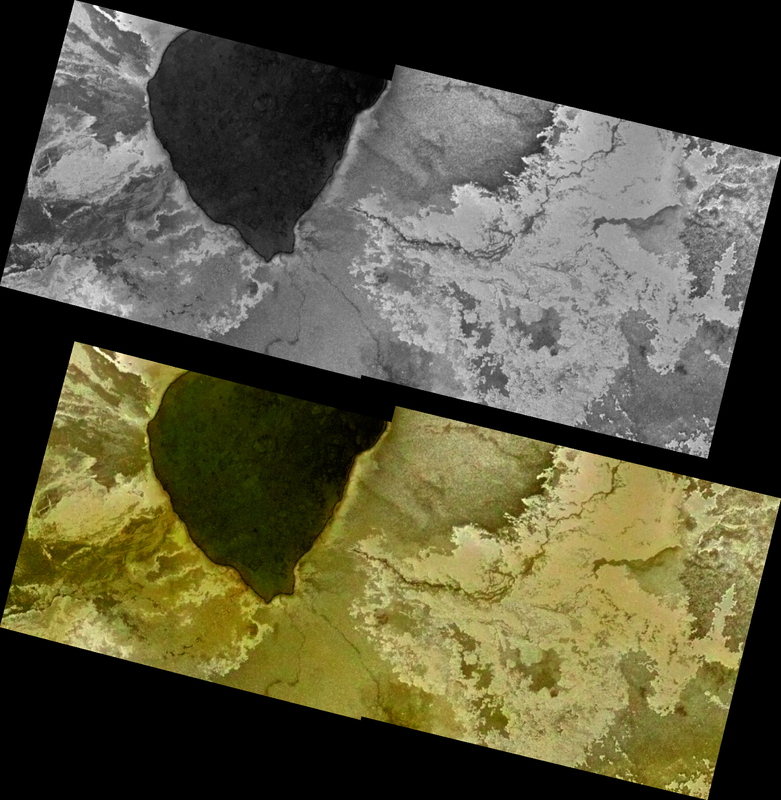 Strangely, the interplay between bright and dark does appear similar to another Galileo observation, a 5.5-meter (18-foot) per pixel mosaic east of Isum Patera taken in February 2000. In both cases, the complexity of the scene makes it difficult to assess the relationship between bright and dark material. In both cases, a bright lava flow is covered at high-resolution. Discussion of that observation may have to wait for another day. What of Emakong Patera itself, what type of volcanic activity occurs there? The patera was not seen as a hotspot until the Galileo flybys in November 1999 and February 2000. These low-resolution observations indicated the presence of either cooled silicate or warm sulfur flows on the floor of the volcano. 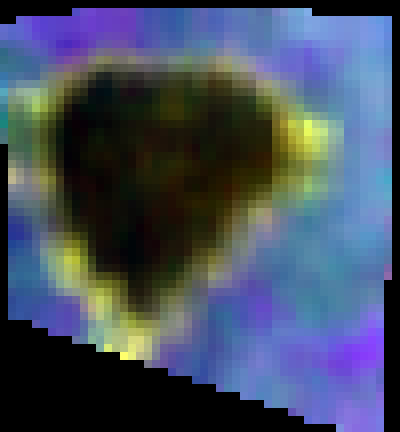 A high-resolution (2 kilometers or 1.25 miles per pixel) NIMS observation was obtained over Emakong Patera during a Galileo flyby in October 2001. This observation confirmed the presence of warm material on the floor of the patera, at least compared to the surrounding terrain. While much of the patera floor had a consistent temperature, the margins were much warmer, reaching a peak near 270 ± 90 K (26±194°F). This observation is consistent with a quiescent lava lake, as the warmer temperatures along the margin correlate with a ring of dark material that lines the outer margins of the patera. The temperatures detected by NIMS are still too cool for even molten sulfur (unless it is highly impure and forms a low-temperature eutectic), suggesting that regardless of whether Emakong is a site of sulfur or silicate volcanism, it was relatively inactive during the Galileo mission (and there is nothing to suggest that this has changed since the mission ended). The temperatures within Emakong are also low enough for sulfur dioxide frost to be detected in the same pixel as a thermal hotspot, the only place on Io this has been detected. While the debate between the predominance of sulfur or silicate volcanism has been settled for much of Io in favor of silicate volcanism, Emakong is one of several locations where uncertainty remains. Regardless of whether sulfur or silicate volcanism dominates at Emakong, it has been years since it was last active beyond thermal emission from warm lava leaking out through cracks in the crust of the Emakong lava lake, unless the sulfur is highly impure and forms a low-temperature eutectic. The large bright lava flows surrounding Emakong tell the tale of past glory for the volcano, which may one day erupt again to flood hundreds of square kilometers in hot silicate or sulfur lava. Williams, D.; et al. (2001). "Evaluation of sulfur flow emplacement on Io from Galileo data and numerical modeling". Journal of Geophysical Research 106 (E12): 33,161–33,174. Lopes, R.; et al. (2004). 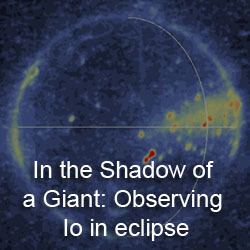 "Lava lakes on Io: observations of Io’s volcanic activity from Galileo NIMS during the 2001 fly-bys". 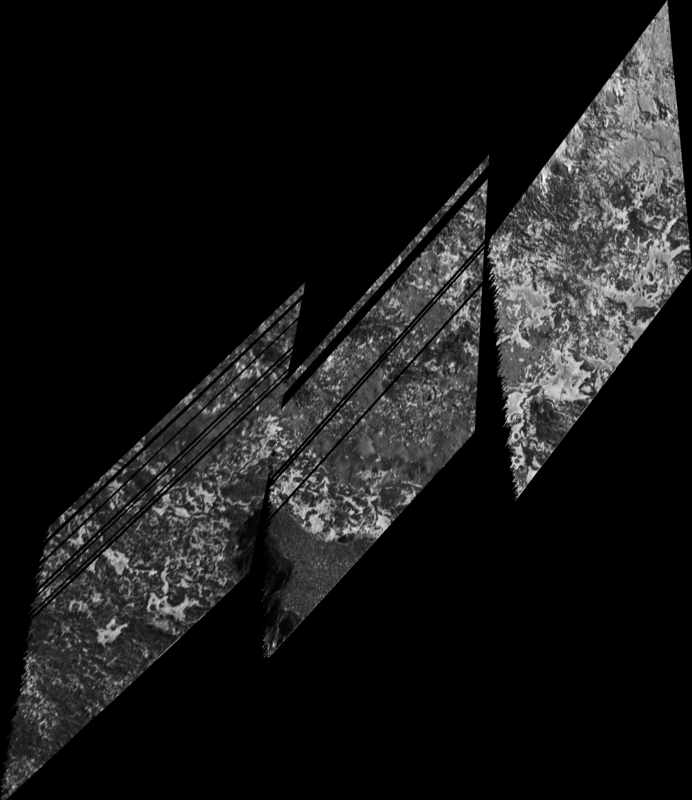 Icarus 169: 140–174.